Fans can re-create the band's famous Definitely Maybe cover in their hometown. 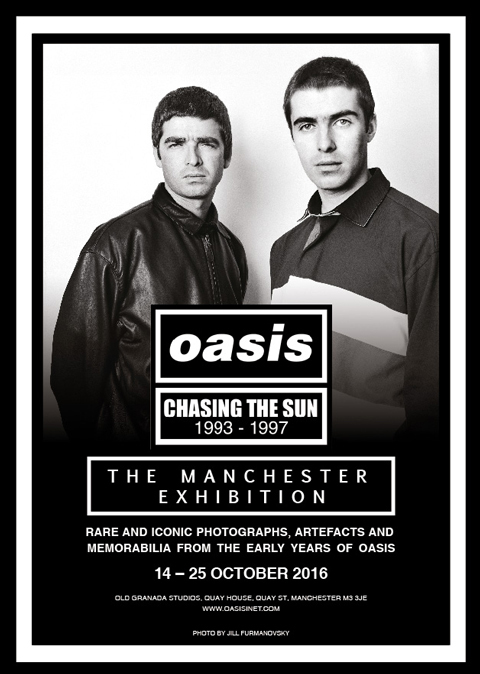 The Chasing The Sun: Oasis 1993-1997 exhibition has finally opened it's doors in Manchester. Following its press launch on Thursday (13 October), the collection has now been made available to the public in the band's hometown. The free exhibition, which includes the Definitely Maybe room - where fans can re-create the famous album cover - will take place from 14-25 October at Old Granada Studios. The Lawrence Watson-created exhibition debuted in London in 2014, attracting over 40,000 visitors in just 10 days, and going on to tour in Tokyo, Japan. But organisers have left the best to last, bringing the show to Manchester where the story of Oasis began and making it bigger and better than ever with even more rare content and photographs. The free exhibition will open daily from 12pm- 7pm, except on Sundays when doors close at 6pm. That's not all Oasis fans can look forward to, however, as the 20th Anniversary issue of the band's Be Here Now record is released today. The deluxe versions of the album includes 14 previously unreleased Mustique demos, recorded by Noel Gallagher and Owen Morris. Radio X will be giving lucky fans the chance to win an epic Be Here Now bundle, so click here for more information.